After enduring an excruciatingly hot August, we rang in September with some yummy potato soup! It’s still over 100 degrees outside, but we’re hoping for cooler weather, almost willing it to come, by pretending it’s cool outside! This has been a record breaking summer, and for us, that’s really saying something. We have plenty of heat and humidity every year, but never in my life have I experienced 119 degree actual temperature until this year. I was thankful for the cold winter we had last year, for I well knew what summer was preparing for us! Turns out I was right. Hmmm…that’s probably a first! I should write that down in my diary! Oh wait, I just did. Sort of. Okay, sorry. On to the soup! I originally found this recipe at my friend, Paula’s, blog. I searched for it to link you to her recipe, but I can’t find it now. So, here’s the recipe that was (is?) on her site. Whether it feels like autumn where you are or not, this will certainly bring it to your soul. Next Post Visit My NEW Blog! I have made this same recipe, from the same source, :o) and you are right, it is *delicious*. This sounds yummy! Do you use the red potatoes? What kind of sausage do you use? I used to make a Baked Potato Soup (not crockpot, unfortunately), but then I discovered Bear Creeks potato soup (dry mix in a pouch). It's SOOOOO easy to make, just add water. Tons of salt, so there's quite a tradeoff. I too LOVE crock pot recipes! I need to start posting a few more of my favorites on my own blog. I certainly appreciate those that you share. 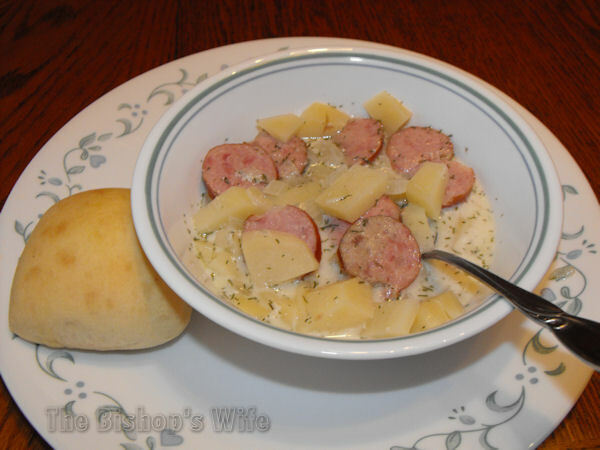 Potato soup is one of my very favorite foods, so I look forward to trying this one. Hasn't this summer been one for the record books?? My goodness it's been HOT HOT HOT HOT HOT HOT!! I do hope your temperatures start to decline soon. We are starting to see the temperatures slowly move back down the thermometer, for which I am most thankful. I am currently awaiting with trepidation the August electric bill. I have missed you during my absence, hope you are well, and look forward to getting reacquainted through the blog world! Have a *wonderful* Labor Day weekend!